Set in a secluded valley, the Manor House has much to offer because of its history, situation, age and legends. 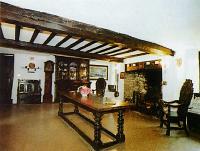 The House dates from the 11th Century and was mentioned in the Domesday Book. It contains eight rooms of period furniture ranging from Elizabethan to Victorian times. Special interests include a Priest Hole and a Haunted Room. The Haunted Room adjoins that used by Lady Jane Grey. It is said that the tenant in 1865 was making some repairs to the roof when he discovered the outline of a window for which there was no room. Investigation led to the finding of a chamber between Lady Jane Grey's room and the one adjoining, in which, on the remains of a bedstead lay the skeleton of a woman. If you wish to stroll around the grounds, you will find over four acres set in a lovely peaceful wooded valley. The delightful main garden offers lawns, shrubbery, herbaceous borders, rose and herb gardens. In the gardens are large and small ponds and the silent pool which is fed by a natural spring. East of Ilfracombe between A399 and B3230. Follow brown signs. Private car park at end of Chambercombe Lane.